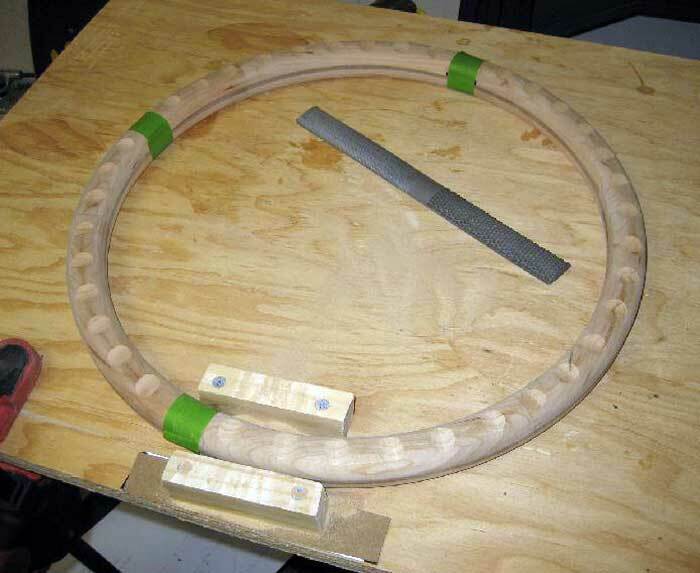 The next step was to fit the steel rim to the wood halves. There would need to be some minor cutting to fit the spokes. If you look closely at the steel wheel, you'll observe that the spokes are welded to the back edge of the wheel rim. 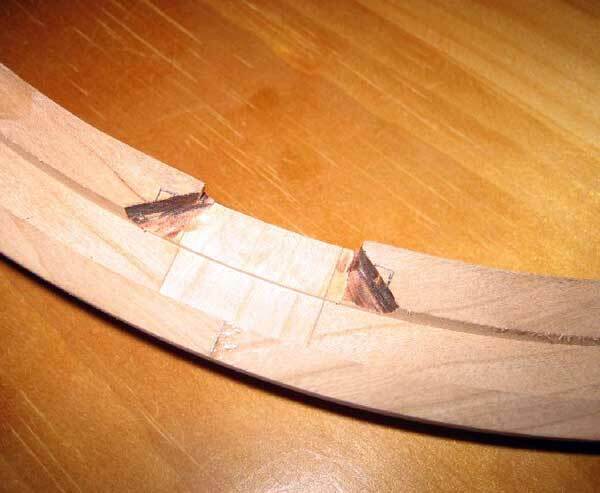 Because of this, only very minor cutting was required on the front half of the wood wheel. I simply marked the areas where the spokes would interfere with the wood and then used a Dremel rotary tool and hand chisel to carefully shave the wood as necessary. If you look closely at the following pictures, you can see where I marked and shaved the front wood blank to fit the steel rim. Before showing the details to fit the spoke, it will make things more clear to first show one picture out of sequence. 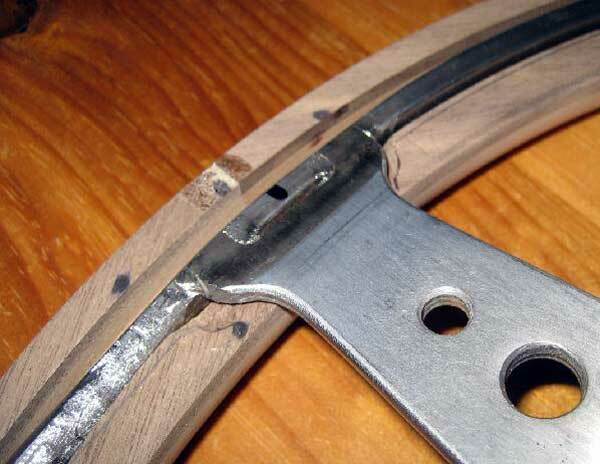 Figure 28 shows the finished design where the spoke is mostly fit into the back half of the wood rim. Only a small amount of material was removed from the front half to accommodate the slight angle of the spoke due to the dished design. 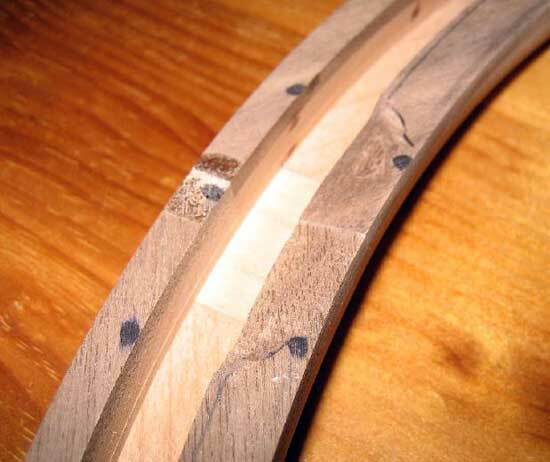 The bulk of the wood removed to fit the spoke was taken from the back wood rim. Figure 29 shows a detail image of the small amount of material removed from the front half of the wheel blank. Figure 30 shows how the spoke rests in front half of the wheel. 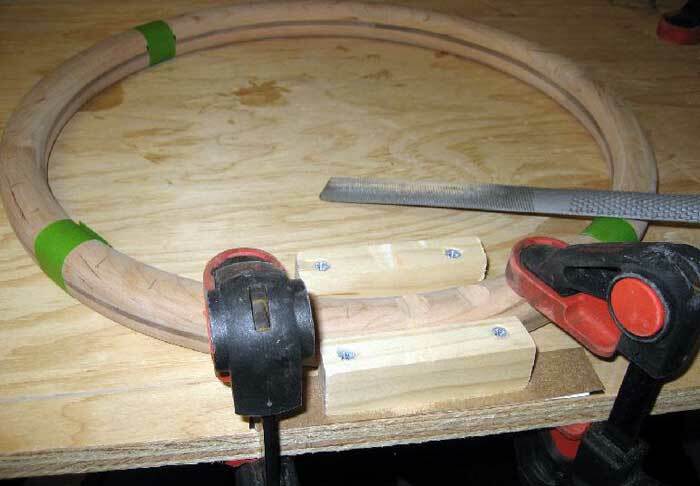 The back wood half would require more serious cutting to fit the spokes. Almost the full thickness of the spoke would have to be accommodated in the back wood blank so again I carefully marked the affected area and then used a router to remove approximately just under 3/16 inches of material. 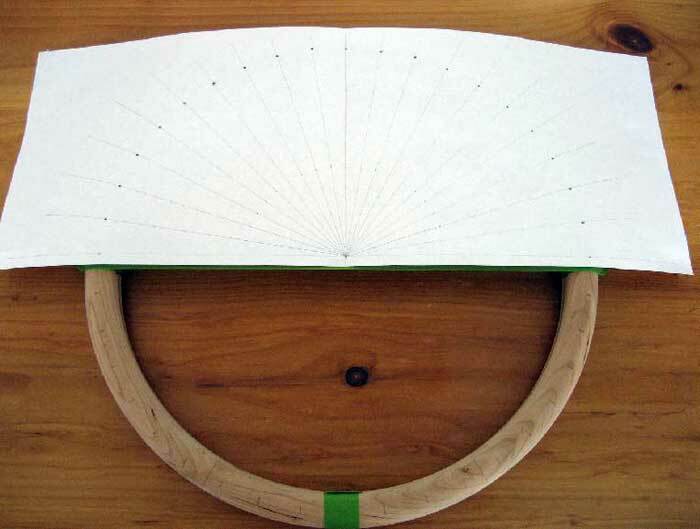 Figure 31 shows the wood removed from the back half of the wheel. I used a router with a 3/8 straight cutting bit to cut this area free hand. A sharp wood chisel would also suffice if doing this operation without power tools. As shown in Figure 32, things are pretty far along and it's actually looking like a steering wheel! I debated for a brief time whether to put finger grooves in the back of the wheel. I have seen plenty of examples of wood wheels and most have the grooves. The few I saw without grooves looked to be missing something to my eye, so the decision was made to put the grooves on my wheel. I measured the old foam grip and measured the depth of each groove at about 3/32 inch and the spacing was approximately 1-1/8. Some quick math and I decided that I would put 40 grooves into the wheel which meant 9 degrees of spacing between each groove. I made a paper template with the necessary layout. I pushed a pencil through the paper to make small holes through which I could mark the wood before making any cuts. 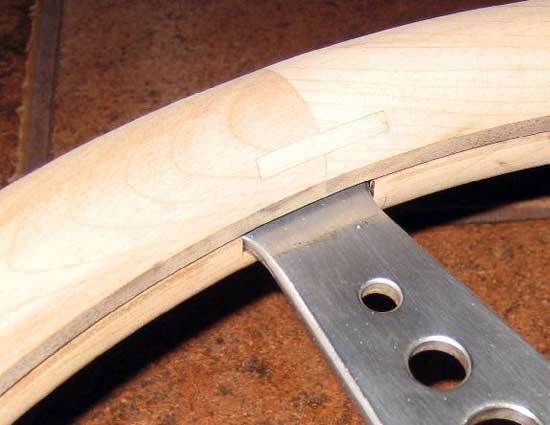 Figure 33 shows how the paper template was placed over the wood rim to mark the location of the finger grooves. Make sure you cut the grooves on the correct side of the wheel otherwise you're likely to invent new curse words should you cut the wrong side of the wheel and be forced to start over! Note that I ended up with only 37 grooves because I didn't put a groove at the location of each spoke, thus 40-3 = 37 grooves. A Nardi wheel that I studied didn't put the grooves at the spoke locations either, thus my decision to do the same. The next issue was just how to cut the grooves. I suppose I could have used a router bit such as a "cove" bit, but I didn't have one and I didn't want to spend $35 for a one time tool. I looked around the garage and found that I had a good wood file with a circular profile of approximately 1-1/8 diameter. I made a few test attempts in my prototype pine steering wheel blank and the results were promising. Thus the decision was made to go the manual, hand-tool route. I wanted to ensure each groove was the same depth so I made a simple jig using two blocks of scrap wood. I cut these two blocks to be 3/32 shorter than the steering wheel thickness, and I fixed these blocks to my work surface. My plan was to simply file by hand at each mark and as soon as the file kissed the wood blocks the groove was complete. Figure 34 shows how the wood blocks were fastened to the work table to act as a jig when filing the finger grooves. This operation was quite simple and the results were outstanding if I do say so myself. It took less than one hour to file the 37 grooves. Figure 35 shows the wheel after all grooves were complete. 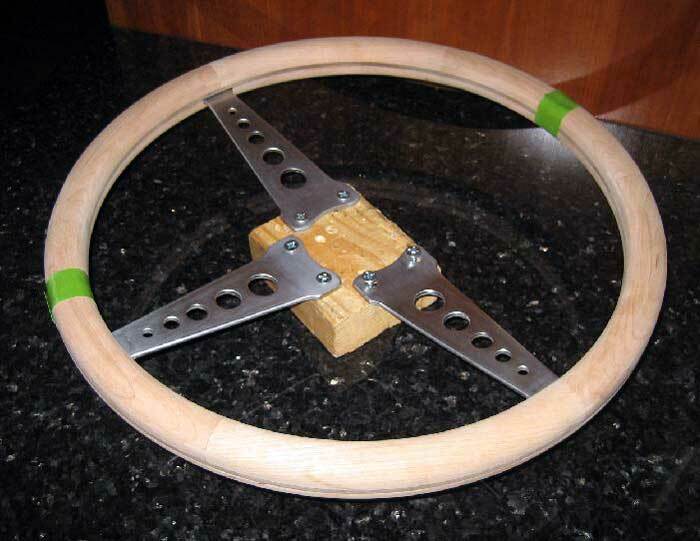 Comments on "DIY Wood Steering Wheel: Part 4 Fitting the Wood to the Steel & Finger Grooves"